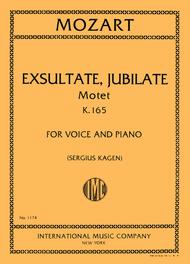 Exsultate, Jubilate, Motet, K. 165 composed by Wolfgang Amadeus Mozart (1756-1791). Edited by Sergius Kagen. For voice and piano (soprano voice). Sacred. Vocal score. Published by International Music Company (IM.1174).